Yesterday I participated in the Winter Bald Eagle Survey. My route was the Winooski River, from Waterbury to Lake Champlain. While I did not see any eagles, I got to see the river in its winter splendor. It was cold. The day started at 3 below zero and got all the way up to 6 degrees. Here is the Winooski River as I saw it yesterday. Deforge Hyrdoelectric Dam. Note the ice after high water earlier in the week. Woodside Park, Colchester. The river is under all that ice. A few days ago it was warm, so warm that rivers ran high and snow melted and we had lots of water. I walked down to the bridge to see the fields. The river gushed under the bridge. The fields had become a lake. The snowmobile trails were a wash. Just recently we finally had enough snow for snowmobilers to buzz around on the local trails. That afternoon they would have needed a boat. Last night the temperature was in the single digits, as it was the night before. Yesterday morning I went for a run. Where a week ago I was dodging mud and puddles and piles of slush, yesterday I ran on frozen dirt. A dusting of snow made the ice patches hazardous. It was a different landscape. Winter came, then spring came, then winter came back. As I have said, I prefer snow. As many have said, if we have winter we might as well have snow. The sun shines today. The temperature might rise to the twenties. It is too cold for sugaring now, although some sugaring happened just last week. 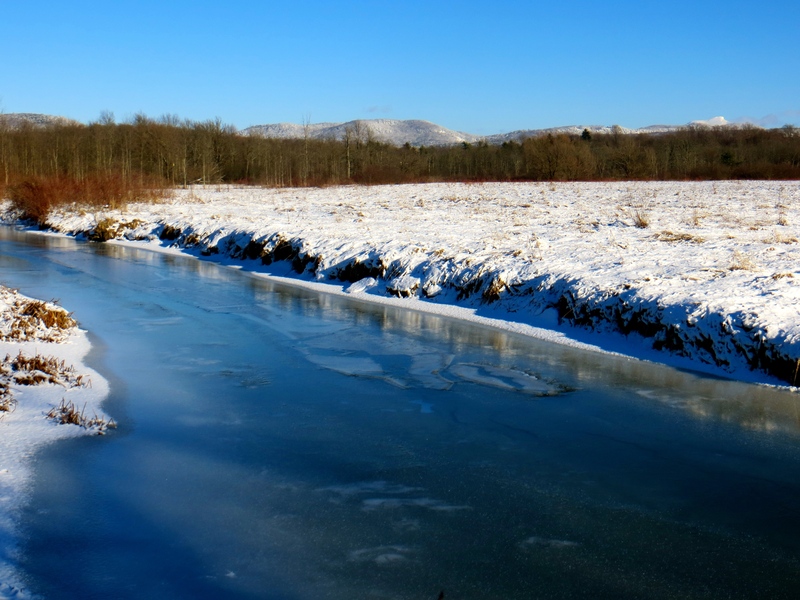 In a couple of days the temperatures will rise above freezing and stay there–too warm for sugaring. Hopefully things will settle out so the sap will run this month–below freezing at night, above freezing during the day. In a month we will have spring for sure. Today I plan to reattach the birdhouse that fell off its post this winter. I want it up by nesting season. Who knows when that will be there this year? Red-Winged Blackbirds have been back for a week, so it could be here in a few days. We might get another snowstorm. Would love that, but I’m not confident. Tomorrow morning I will get out and run again. Maybe we have mud. Maybe we have ice. Either way I look forward to getting out there again. Winter and Spring can duke it out. Regardless, I am going to do my thing. The forecast called for snow. And rain and sleet and freezing rain. It looked ugly. Predictions foretold a tricky morning commute. Weather would be worst just when buses would be transporting children to school. It was a set up for a snow day. So said the forecast. I would believe it when it happened. We have had so little snow this year (and last year) that I am skeptical of any forecast for wintry weather. But sure enough, my wife woke me up this morning to tell me that schools all across the state were closed. Then the phone rang–recorded message that our school was closed. I was scheduled to be at two different schools today–one in the morning and one in the afternoon–and they were both closed as well. Snow day. But it wasn’t really a snow day. It rained hard last night and was raining hard when I fell asleep. It turned to snow at some point and there was some sleet mixed in at some point. It was snowing when I woke, then rained again to freeze on every exposed surface. It was icy and sloppy, and treacherous driving was a given. It made sense to cancel school. I did do some work from home today. I always have something I can do, although I have to reschedule two school visits now. That’s always a hassle. But still. Snow day! Even though it means a pain the backside for me, I always love a snow day. Today was a bonus family day. I went out to get some sandwiches in town, just for a fun lunch (and the driving was pretty slow), but otherwise we stayed home together. As my children get older those family days will get fewer, so it is worth taking advantage of them. Tomorrow I will be back at it. I have some prep to do for the day yet. We won’t have two snow days in a row. But I feel a little more energized, a little more buoyant. A snow day is like a mini-vacation. I don’t want it to end, but I am better prepared to get things done tomorrow. Not a bad deal. As the day lightened I stood on the edge of the field, listening. A Northern Cardinal called, then another. A Song Sparrow sang, just once. Two geese flew overhead, honking quietly, as if they needed to talk but did not want to wake anyone. I did not hear the woodcock again. My wife had woken me to tell me she heard a woodcock, then tossed open the window and we heard it together. It bleated its noisy song, then rose in circles and dropped back to the field, its feathers whistling as it fell. Rain dripped off the off. I went outside to try to hear it again, but by the time I stood there listening, its dance was over. The morning was warm enough to leave hat, gloves, boots in the mudroom. It smelled like spring–the earth thawing, grass stirring, mud, last fall’s rotting leaves. Ice, however, lingers in the shadows. On the north side of the house a triangle of ice nestles the compost bin. The compost–hard to stir as feathers of ice burst from its crumbling body. Between stones, ice frames pebbles. Below trees, logs of ice under logs of wood. As I watched the morning, wind blew across the brown. The rain stopped, waiting for afternoon to start again. Robins chattered and crows cawed. But I did not hear the woodcock again. The warm day melted some of the hidden ice. When the sun set, rain again fell from the roof. Dampness seeped under the door. In the morning, perhaps, the woodcock will dance again. I will rise in the dim light, again, to listen. My son and I took a hike up Mount Philo yesterday. It was a mild day, just above freezing, some sun, some clouds. A good day for a short hike. I was afraid it might be muddy on the trail. Instead we found ice. There is a paved road that leads to the summit where a campground operates seasonally. The trail is much nicer than the road, however. In most places the trail was frozen and passable, but we had to do some navigating at times to avoid slipping. In more than one spot a slip on the ice would have meant a good trip downhill. It was a fine adventure on a Sunday afternoon. The view, as it is most days, was stellar. We looked at places we had been and might one day go. We watched a raven soar in and drop to land on the cliffs below us, croaking as it did so. We watched clouds creep in over the Adirondacks to bring us rain for today. We lingered a little while and then headed down. We started to follow the road, then decided to take the trail when it crossed that road, but just as we turned off a large and loud group turned off as well. We decided to take the road. The walking was easier and we chatted as we descended. I noticed a couple of hemlocks that looked in trouble. Some of the tallest trees around, they had only brown needles and were full of cones. I wondered if they had been killed by the Hemlock Wooly Adelgid, an introduced pest that can decimate these trees. Eastern hemlock just might be my favorite tree, so if the adelgid is here, my heart sinks. Now, early morning, it rains. It taps the porch roof. Again, the air is warm, and it blows over the fields, tossing last year’s leaves about and howling through the bare branches of the maples. Yesterday I heard Red-Winged Blackbirds singing. It was the earliest I have seen them here. The sky is gray. The fields and woods are brown. The red stripe on the blackbird’s wing is a harbinger of spring color. Next month, blackbirds will be flashing those red stripes as the field grows green and mud, by then, will replace the ice we encountered yesterday. 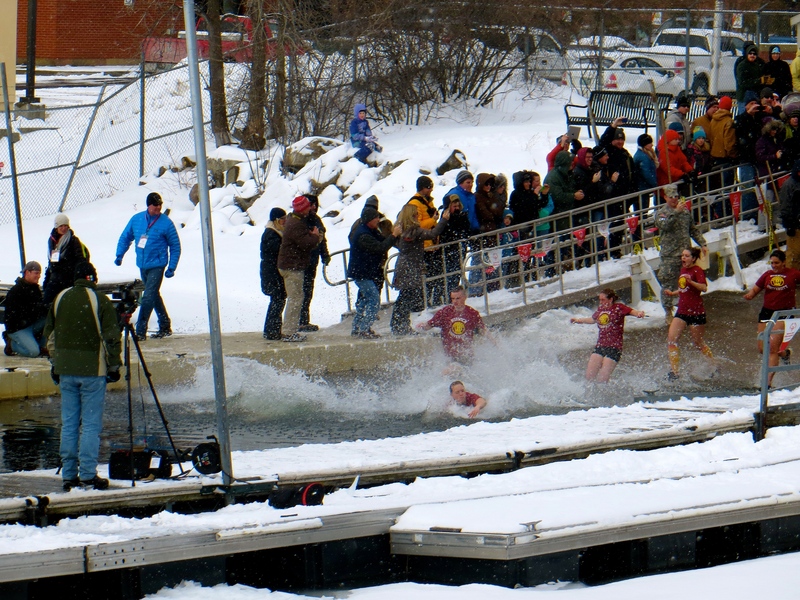 Every winter Special Olympics Vermont holds the Penguin Plunge, a fundraiser that draw all kinds of people who want to take a quick dip into Lake Champlain. My wife and daughter took part yesterday. Each year the sixth grade class at my daughter’s school (led by a motivated and inspired teacher) raises funds and gets fired up to jump in the lake. It was about ten degrees yesterday. At least the air was that cold. The lake was just about 32 degrees, so clearly a nicer place to hang out than the breezy waterfront. My son and I watched groups run down the boat ramp and get wet. While a few groups of high school boys did swim the short distance of open water the ice’s far edge, most people were in and out of there fast. I have been in water that cold and I know that it quite literally takes your breath away. It is hard to breathe and one’s muscles don’t respond very quickly. Staying in for long is not a good idea. There were a few people on the dock in dry suits ready to pull anyone out who needed help, but everyone I saw was pretty motivated to make tracks back up to the warming tent. The event is well organized and has lots of positive energy. There are two changing tents–for men and for women–as well as a staging tent where plungers wait until their wave is called. Everyone who participated got cold, of course, but not for long. Those tents are toasty. It was enjoyable to watch. It was hard to watch and not to participate, in fact. I wanted to get right in there with them. But somebody had to park the car and take the photos. Next year, however, I may have to take a swim as well. A couple of times today my daughter mentioned that she went in the lake yesterday. I think she was proud of herself. I told her that went swimming just last week and she pointed out that swimming in Florida doesn’t count. True. Really, I was proud of her too. Yesterday my son and I walked down to the river. It was a perfect winter day–23 degrees, sunny, with a thin layer of new snow on the ground. A couple of Hairy Woodpeckers flushed as we got close to the bridge. A Tufted Titmouse whistled across the field. The air was still. We walked through the trees to the water. In spring, the river bank is often flooded, water to my knees or higher, but yesterday the grass was brown and flattened, the puddles frozen. We could see the frozen river and all the way across the field on the other side. The landscape changes every season, every day really. Where in summer the scene would be green–the grass, the leaves on the trees, even the water–yesterday it was brown and white and blue. Beautiful either way. The water was frozen from shore to shore. This is not a big river. You could easily toss a rock or a stick or dirt clod to the other side. But it moves along and meanders and isn’t typically solid, even in winter. We might have been able to walk across but we were cautious. We walked along the ice on the shore, watched the water flow under the bridge where the surface was not frozen, crunched our way through the sleeping vegetation. To get back home we eschewed the road for as far as we could. I followed the shore north while my son bushwhacked through the willows. I watched the tops of them wave and bend as he pushed his way toward me. He emerged with a big grin. The breeze started to pick up as the shadows grew. We walked on the ice that filled the ditch along the road. Camel’s Hump glowed in the sun that has stayed away too often lately. The next morning the temperature would dip just below zero, but in the moment we were content with a fine winter day.